City Corporation Counsel Stephen Patton and Mayor Rahm Emanuel. Rahm Emanuel is trying to turn around his political image by working to solve big problems — citizen mistrust in the police among them — before deciding whether to seek a third term. The mayoral pivot, as the Tribune editorial board called it, comes on the heels of a string of Emanuel's alleged successes, including a deal to avert a Chicago Teachers Union strike and midterm promises to hire 1,000 new police officers and direct cash to fund youth mentoring programs. And don’t forget the huge property tax hike to save city worker pensions and spare our city from the threat of going bankrupt, at least for now. It’s all part of a look forward, don’t look backward strategy that has been expertly spoon-fed to Chicagoans by the City Hall spin machine. Emanuel has pleaded with Chicagoans to look to the future since Nov. 24, 2015, the biggest, defining moment of his tenure. That’s the day Emanuel followed court orders to release dashcam video from Oct. 20, 2014 — two years ago, today — showing Chicago Police officer Jason Van Dyke shoot Laquan McDonald with all 16 bullets in his gun until the black teenager was dead. “All of us will be judged by our actions, and I call on all of us to look inside ourselves and see this moment as a potential to do something that we have talked about and discussed, but for reasons have not actually endeavored to journey on," Emanuel said at the bizarre news conference called before the Laquan McDonald video was made public. In other words, onward. Don't look back. But as the mayor tries to pull off this political pirouette in an attempt to improve his chances of winning a third term, it’s worth pointing out that the past matters as much as the future. Even things the mayor doesn’t want to talk about anymore. The existence of the "Thin Blue Line" code of silence in the Police Department, for instance. Another example: Emanuel's public admission that his administration went along with a policy to keep facts about police-involved shootings from the public that has existed for 40 years. And the mayor certainly doesn't want to talk about it under oath. Since Emanuel admitted a code of silence existed in the Police Department in December there have been at least four attempts to depose the mayor as part of federal civil rights lawsuits alleging police misconduct, according to court papers and records obtained through the Freedom of Information Act. Each case is different, but the reason those lawyers want to depose Emanuel is the same: to prove their client has a valid “Monell claim" in court that allows people to seek cash damages from the city for the actions of employees which, in these cases, are police officers. To do that, civil rights attorneys must prove in court that city officials, including Emanuel, knew of the existence of a policy, custom or practice that effectively permitted the misconduct alleged in a civil rights lawsuit. City Hall lawyers have actively fought to stop the boss from being forced to answer questions about the culture of lying to cover up misconduct in the Police Department. Could it be that Emanuel is able to avoid real accountability — and sworn depositions — because City Hall bureaucrats, like those in the Police Department, operate under the protection of unwritten policies, practices and legal standards aimed to protect Chicago’s boss? • In a federal case involving allegations that an intoxicated cop accidentally shot a boy in the head, city attorneys argued that Emanuel shouldn’t be deposed because the mayor is “not a policymaker for the city,” according to court papers. Rahm Emanuel isn’t a policymaker? C'mon. Federal judge Harry D. Leinenweber didn’t buy that argument either. He wrote that it was “hard to take that position seriously,” suggesting it’s “common sense” that the mayor has considerable authority, particularly over the Police Department. Still, Leinenweber denied the request to depose Emanuel. Why? 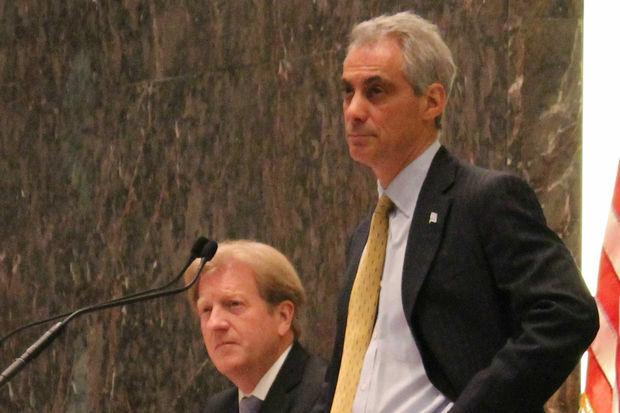 Because civil rights attorneys had established a “real need” to depose the mayor and had not submitted written questions to Emanuel first, according to court papers. • In May, 11 days after federal judge Gary Feinerman ruled that the mayor would be required to testify about the code of silence in a case brought by cops who claim they were blackballed for blowing the whistle on police corruption, city corporation counsel Steve Patton settled the case for $2 million. Coincidence? You make the call. City lawyers argued that allowing Emanuel to be deposed would “essentially force the mayor of the third-largest city in the United States to be a witness in every single” case alleging police misconduct, according to the Sun-Times. They argued the mayor was too busy to be deposed. “Rather than abide by rules with which she disagreed and take up those rulings on appeal as necessary, Kurtz chose simply to ignore them whenever convenient to her case,” Judge Ellis wrote. If Kurtz made some shady moves she should be held accountable. Unless, that is, you are the mayor of Chicago. In that case, if you want trust ... you have to pivot.